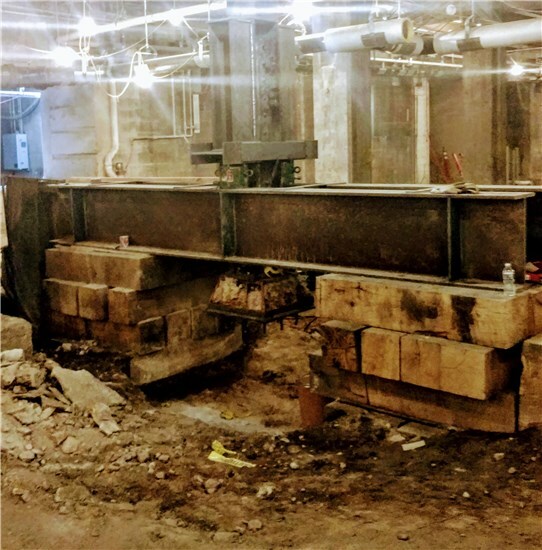 Photo is in the basement of a prominent museum in Philadelphia, PA. As part of the Core Phase project, the museum is performing a lot of excavating to make way for increased usable space for galleries, classrooms and support areas. In some areas, they have found that the footings below some of the 90 year old support columns need to be deeper and/or repaired. The shoring is in place on either side of the support column so that they can install new footings. The scale of this is pretty impressive when you consider the bottle of water on the right hand side of the photo. Questions? Contact us at info@horizon-engineering.com.